This pet portrait is of a lovely dachshund called Zak. This is in his memory as he sadly passed away some time ago. The client decided to give this pet portrait as a gift to her partner, Zak's owner. The painting is 20 x 25cm in size and is painted with acrylic paints on primed stretched canvas. The client is planning on framing it at a later stage. I would recommend framing paintings without glass as acrylic has a lovely surface and the reflection from glass might take away from that. Below is a scan of the final painting with detail underneath. The detailed image shows the painting in approximately its actual size. For more information on pet portraits commissions, wildlife art commissions or prints and cards of your previously commissioned artwork, please contact me. 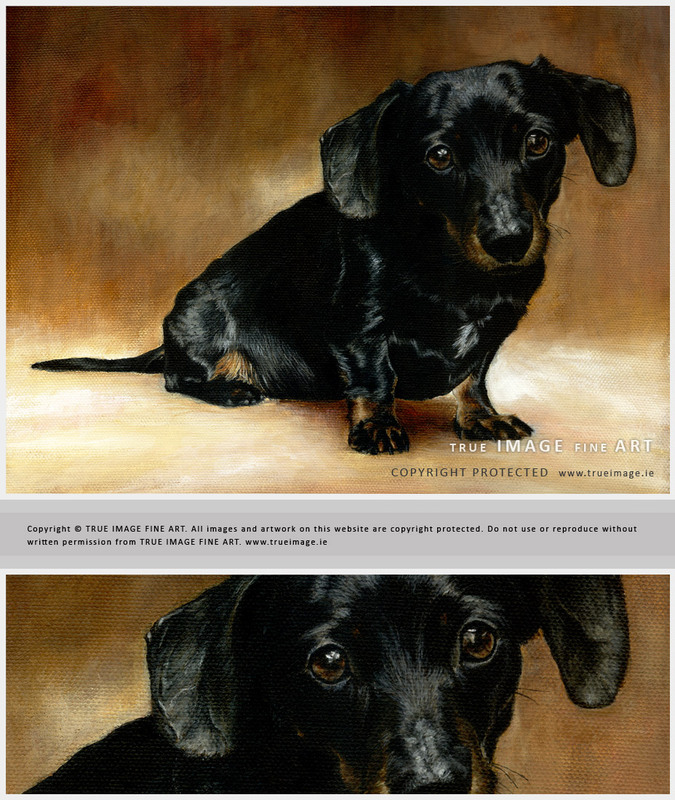 For Zak's pet portrait, I worked from two photographs. I used facial expression of one and body position from another photograph. The background was matched to Zak's brown highlights. 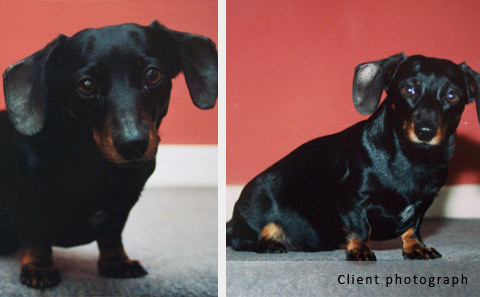 Below are progress photographs that were taken as the pet portrait was developing. As always with acrylic paintings, I started with an underpainting in a combination of burnt umber and raw umber. In Zak's case these colours played off the tan highlights on his paws and nose. All progress photographs are posted on the Art in Progress Blog so clients can see how I am progressing and leave a comment if they like. "The painting is really lovely, I felt I could almost pick Zak up - it is so true to form, and I feel you have captured his personality so well. Thank you again Ivana, I am very much looking forward to seeing the finished painting."